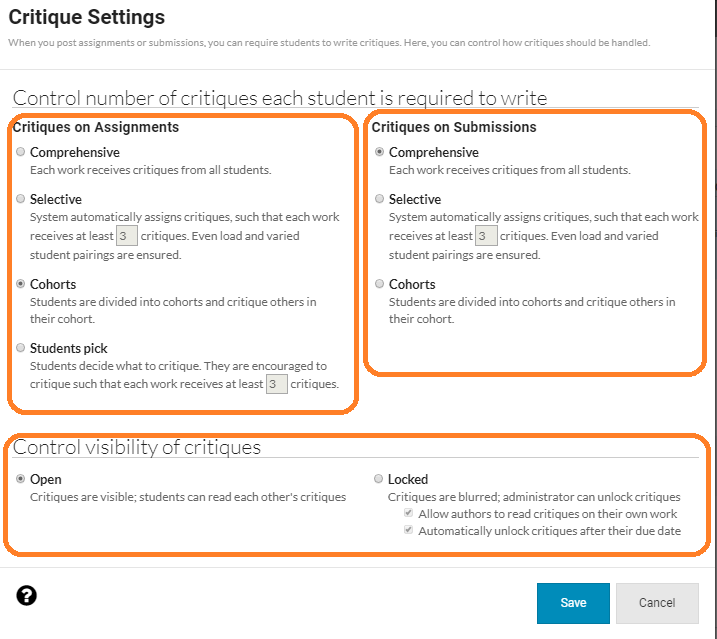 Learn to adjust your critique settings to match your class style. Every instructor and every class can have different needs around critique and feedback. Wet Ink offers you a variety of built-in options on how critiques can be assigned. Comprehensive: Every student will critique any submitted work. For example, if you have 10 students completing an assignment, every student will have 9 critiques to write. If you are using submission, this setting will ensure the entire class responds to that submission (much like a traditional workshop). Selective: Every submitted assignment will receive a certain number of critiques; the number is up to you. This ensures that each student receives the same number of critiques on their work. This total number of critiques will be split up among the students. Our system chooses students in a way so that an even workload and varied student pairings are ensured. Cohorts: The instructor will divide students into cohorts and students will only critique others in their cohort. These cohorts can be managed and changed at any time in class administration. You can move the students and/or create new cohorts at any time. Students Pick (assignments only): Every student is required to complete a certain number of critiques; the number is up to you. Students, however, can choose which pieces to critique, so it does not guarantee an even number of critiques given to each completed work.